Nailsworth C of E Primary School in Gloucestershire is situated at the top of our bustling little town, next to Forest Green Rovers Football Club! 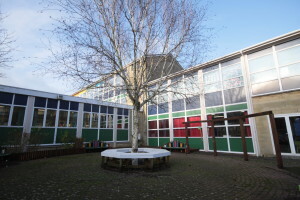 Just one of the lovely outdoor spaces at Nailsworth Primary School. Strengthening the spirit by being grateful and giving extraordinarily. We believe in supporting children to express their hopes and dreams (no matter how small or big!) and then help to make them happen. We endeavour to provide an environment for children to become independent, successful learners with a clear desire to achieve. We do our best to create the opportunity and time for children to indulge in their interests and add the best teaching/coaching we can find. We are continually developing innovative, inspirational and creative ways of encouraging children to learn to their highest potential. Would you like to arrange a school visit? Nailsworth Church of England Primary School welcomes you to come and see for yourselves; we love to share what we are discovering. If you would like to come in and talk with someone about the opportunities we could offer to your child or children, please call Sarah or Cat on 01453 832382 or get in touch via e-mail at admin2@nailsworth.gloucs.sch.uk or you can use the Ask Us A Question button (at the top of every page).